Left ventricular hypertrophy (LVH) is the increase in the size of the myocardial cells (not the number of them) in response, in most cases, to an increase in cardiac work. This enlargement of the myocytes causes an increase in muscle mass of the left ventricle and can lead to an enlargement of the left ventricle without dilatation of the left ventricular cavity. Although both alterations (hypertrophy and left ventricular dilatation) may coexist. Left ventricular hypertrophy, especially in patients with hypertension, increases the risk of heart failure, ischemic heart disease, sudden death, atrial fibrillation and stroke. The electrocardiogram does not have the sensitivity or specificity that the echocardiogram has, which is the reference technique, but its greater availability make it one of the main tools we have for the diagnosis of left ventricular hypertrophy 1. The main cause of left ventricular hypertrophy is the adaptation of the myocardium to a pressure overload in the left ventricle. Hypertension is the most frequent cause, but also aortic stenosis or coarctation of the aorta cause LVH by this mechanism. Hypertrophic cardiomyopathy is a genetic disease that causes left ventricular hypertrophy, especially septal hypertrophy, in young patients without pressure overload. LVH often progresses to severe and serious complications such as left ventricular outflow tract obstructions, ischemic heart disease or arrhythmias. Other causes of left ventricular hypertrophy are obesity (alone or associated to HBP) and mitral or aortic Insufficiency 2 3. When increasing the muscle mass of the Left Ventricle, there is a greater voltage of the R wave in left precordial leads (V5-V6), and a deep S wave in right precordial leads (V1-V2). There is also an increase in QRS duration (greater than 100 ms), especially an increase in intrinsicoid deflection (greater than 50 ms). Tall R waves in leads V5-V6 and deep S waves in leads V1-V2, minimal widening of the QRS, ST depression in leads I, II, III, aVF, V5, and V6. Furthermore, an ectopic atrial rhythm is observed, except in the first and in the 9th beat (negative P waves in inferior leads and short PR interval). It is common to find alterations in ventricular repolarization, observing ST segment depression and negative T waves in lateral leads (I, aVL and V5-V6). This ST depression is asymmetric, with a smooth initial depression, followed by a negative T wave and fast final ascent. A similar ST segment depression can be observed in patients with ischemic heart disease or digitalis toxicity. Heart axis may be within normal (but between 0º and -30º) or deviated to the left. 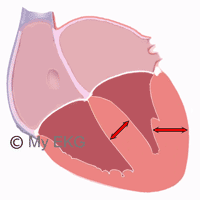 Some patients may present left bundle branch block. Signs of left atrium enlargement may be observed with wide P waves (P mitrale) in inferior leads and left precordial leads. A predominance of the negative portion of the P wave in V1 may also be observed 2. Tall R wave in V5-V6 and deep S wave in V1 and V2. QRS >100 ms and intrinsicoid deflection >50 ms or Left Bundle Branch Block. 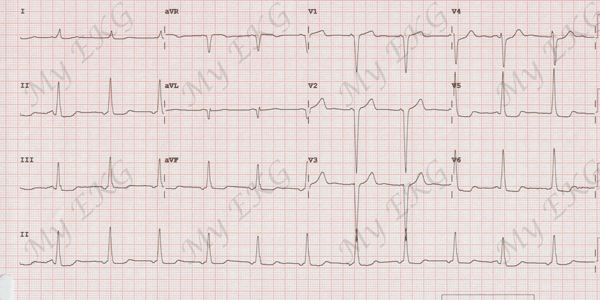 ST segment depression and negative T waves in lateral leads. Normal axis or left axis deviation. Wide P wave or predominantly negative in lead V1. There are several methods to diagnose Left Ventricular Hypertrophy. Most of them has high specificity but low sensitivity. These criteria are valid only in the absence of Bundle Branch Block. It is the best known and perhaps the easiest to apply. It consists in measuring the S wave depth in lead V1 and adding the largest R wave in V5 or V6 (the higher voltage of the two). It is a diagnosis of LVH if the sum is greater than 35mm. It has specificity around 95% but a low sensitivity. In young and thin patients can be misleading. It is obtained by adding the R wave in aVL with the S wave in V3. It is positive for LVH if it is greater than 20 mm in women or greater than 28 mm in men. It has a sensitivity of around 40% and a specificity of around 92%. If it is used together with the Sokolow-Lyon increases the sensitivity of it. It is more complex to use than previous ones but has a greater degree of specificity and sensitivity. It measures each of the alterations that Left Ventricular Hypertrophy can cause on the Electrocardiogram< and assigns points. It is diagnostic of LVH if it is greater than or equal to 5 points, and probable LVH if it is equal to 4 4. In 2017, Peguero, Lo Presti et al, proposed novel EKG criteria for LVH, taking into consideration the dynamic changes in voltage that occur within each electrocardiogram. The authors demonstrated that the summation of the amplitude of the deepest S wave in any lead (SD) with the S wave in lead V4 (SV4) provide a more sensitive measurement in the EKG diagnosis of LVH compared with the currently existing criteria. In cases in which the SD is found in lead V4, the S wave amplitude should be doubled to obtain the value SD + SV4. A SD + SV4 ≥2.3 mV for female subjects and ≥2.8 mV for male subjects are considered positive for LVH. These criteria did not improve upon the limitations of previous criteria in patients with bundle branch blocks, ventricular paced rhythm, concomitant right ventricular hypertrophy, and other cardiomyopathies 5. As expected, patients with Left Ventricular Hypertrophy can also present bundle branch blocks. LVH is even more prevalent in patients with left bundle branch block than in the rest of the population. So ... How to diagnose LVH in the presence of bundle branch block? The right bundle branch block completely changes te QRS complex morphology, so voltage criteria are not valid in these patients. Left Ventricular Hypertrophy may be suspect when left atrial enlargement is observed without other associated pathologies; in other words, presence of wide P waves (mitrale) in inferior leads or predominantly negative P waves in lead V1 3 4. If the suspicion is high, an echocardiogram should be requested. The prevalence of Left Ventricular Hypertrophy is higher in patients with left bundle branch block, so it is important to be able to diagnose it with the Electrocardiogram. Some authors have shown that voltage criteria are as valid in this pathology as in patients with QRS complex less than 120 . The presence of left atrial enlargement criteria increase diagnostic possibility 3 6.